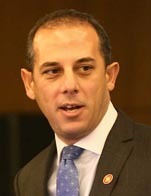 Marios Demetriades has been Cyprus's Minister of Transport, Communications and Works since March 2014. He has focused mainly on the Maritime and Aviation sectors, recently completing the commercialization of the country's largest commercial port, Limassol, attracting international port operators such as Eurogate and DP World. He is currently working on the commercialization of the second largest port in Cyprus and reforms in the Aviation, Merchant Shipping and Postal services sectors. Before joining the government, Mr. Demetriades was a Manager at Piraeus Bank (Cyprus) for six years. Prior to that, he worked at Laiki Bank Group for approximately 9 years in the Investment Management sector. He has been a member of the Chartered Financial Analyst Institute (CFA) since 2000. He is a Chartered Accountant (ICAEW) and a member of the Institute of Certified Public Accountants of Cyprus (ICPAC). From 1996 - 1998 he was manager of the local office of Ernst & Young in Paphos, Cyprus. He trained as a Chartered Accountant with BDO Stoy Hayward in London from 1993 - 1996. Mr. Demetriades studied Business, Finance and Economics at the University of East Anglia, UK.